One of the things I often get asked by people who have not seen our sport is, ‘do you have a women’s team?’ When I reply that ours is a mixed sport with men and women playing in the same teams, they are usually a bit taken aback. I can see them thinking about chairs colliding and worrying about an unequal physical match. Of course what they have not understood is that functionality is more important than gender and that our classification process ensures equal matching and a safe environment for everyone who plays. That said, I have never worried about any of the women I have seen play being able to take on the men! In GB the likes of Kylie Grimes, Nathalie McGloin, now a racing driver (how cool is that!? 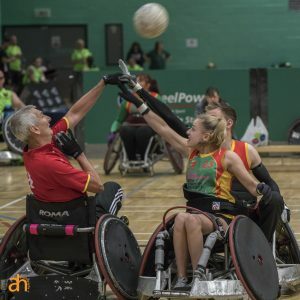 ), Josie Pearson MBE (who was the first woman to compete in wheelchair rugby for their country at a Paralympic Games, and subsequently went on to win a gold medal at discus in London 2012), and Coral Batey have all shown themselves to be highly skilled and capable athletes. At the Sydney World Championships this summer, Ciara Staunton (Ireland), Kai Kurahashi (Japan), Izabela Sopalska-Rybak (Poland), Paola Martinez (Colombia) and Maia Amai (NZ) all showed that they were able to compete with and against the very best in the world. At the moment we do not have a woman in the GB squad but we do have a number of talented young women such as Tilly Robinson, Faye West (both Westcountry Hawks), Lou Tempest (Yorkshire Lions), Gemma Lumsdaine (Caledonian Crushers), Issy Bailey and Ella Beaumont (both Stoke Mandeville Maulers) who are regularly playing the game and who all have bright futures ahead of them. 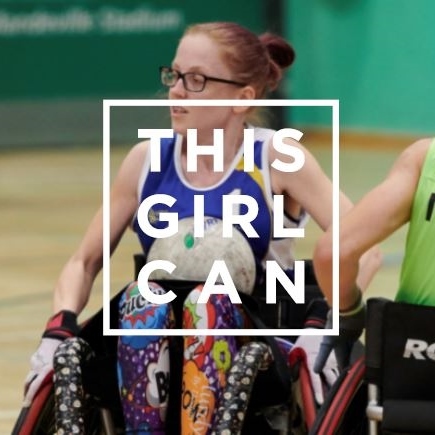 We are still keen to attract more women and girls into our game and on 28th October we will fire up the #ThisGirlCan campaign with a celebration of women and girls’ involvement in wheelchair rugby at the Brentwood Centre in Essex. This will be a great opportunity to ‘have a go in a chair’ and to meet players, volunteers and GBWR staff. So if you have a female friend or relation, or anyone who fancies the chance to have a go, then encourage them to get along to Brentwood. Our sport has opportunities for everyone – if you just want to play, have fun and meet new people then our club environment is for you. If you have aspirations to play for your country then get playing now in a club where you will be coached well by an accredited coach and have the chance to be selected for the Talent squad – you could be the next Josie Pearson or Kylie Grimes… though I think Tilly, Faye and the others are determined to bag that spot first! If you want to find out more about the day then Julie will be happy to talk to you – get in contact at julie.bunnage@gbwr.org.uk. When I was in Sydney for the World Championship this summer I couldn’t fail to notice the attention the Invictus Games was getting. Pretty much every day there was a commercial on TV highlighting that the games were on their way. 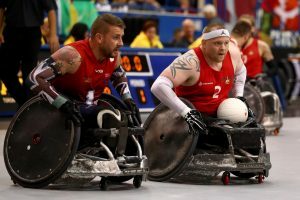 Wheelchair rugby is a highlight of Invictus and GBWR can be proud of the part we played in creating the Invictus format. Back in 2014 we worked with the first Invictus organising committee to produce options for a game format which would fit the Invictus schedule, and little has changed from what we came up with. Prior to Invictus we were working with Help for Heroes and offering wheelchair rugby at Headley Court and in the Personnel Recovery Centres so we were already familiar with working with injured service personnel. One of the first who tried the game was Stuart Robinson whilst he was at Headley Court so it was fantastic to see him become the first Captain of the Invictus wheelchair rugby team, but even more of a delight to see him classified into the Paralympic discipline of the sport and to witness him play for GB in the World Championship. That is quite a journey and one which he and our sport can be very proud of. We remain closely involved with Invictus and Paul Jenkins continues to coach the GB team. So it’s almost time for Invictus to hit Australia – the team leave for ‘down under’ on 15th October. This year the wheelchair rugby team has been limited to 8 athletes captained by Clive Smith. Clive served for 11 years in the Royal Engineers and was a bomb disposal expert. On his second tour of Afghanistan he was the lead man on patrol and stepped on an IED which resulted in him losing both his legs above the knee and sustaining multiple other injuries. This will be his third and final Invictus tournament so he is intent on bringing back that gold medal. You can read more about him at www.letsgetlegs.co.uk . 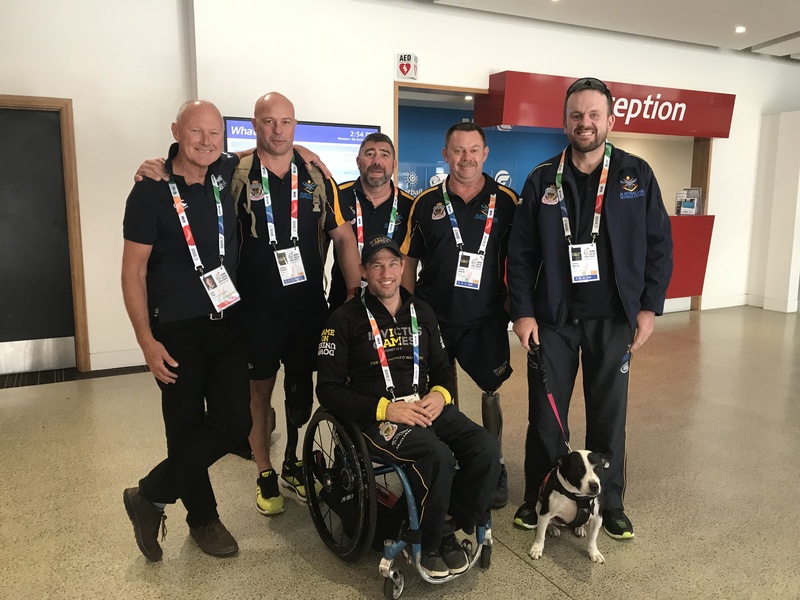 I figure that if you have a cool enough head to be a bomb disposal lead then you probably have the ideal temperament to captain the Invictus team! Another of this year’s players is former Royal Marine Peter Dunning who has also come through our training system and now plays for RGC at Glyndwr University – here you can read his story. 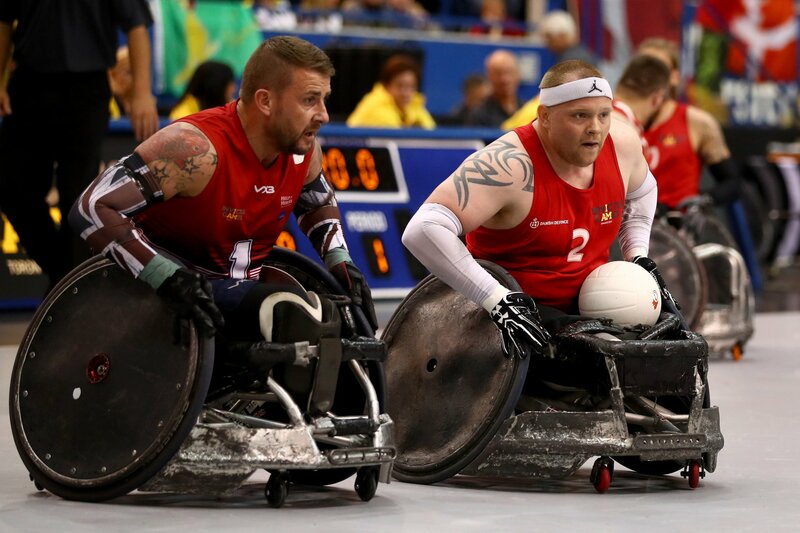 There are 8 nations competing at wheelchair rugby: Canada, USA, GB, France, New Zealand and Australia. When I was in Sydney I met the Australia team who were at the Worlds. GB has always medaled at these games – Gold in London 2015, Bronze in Florida 2016 and Silver in Toronto 2017 – so Jenks will be looking to go one better and pick up that gold again. We wish the team the very best of luck. Finally, there is plenty taking place on these shores this month! RDO Dale is holding taster sessions in Bolton on 11th and 18th of October which Crash are supporting, RDO Adam is also giving taster sessions in Aldershot in partnership with the local authority and Louise has organised a ‘Time to Listen’ safeguarding course for 3 November in Stoke on Trent which all clubs should attend; not forgetting the Super Series with Division 2 on 13th & 14th and Division 1 on 20th & 21st.